Jarrod Bowen clipped the post with a free-kick for the visitors before Norwich’s Marco Stiepermann weaved into the area and guided home an opener. 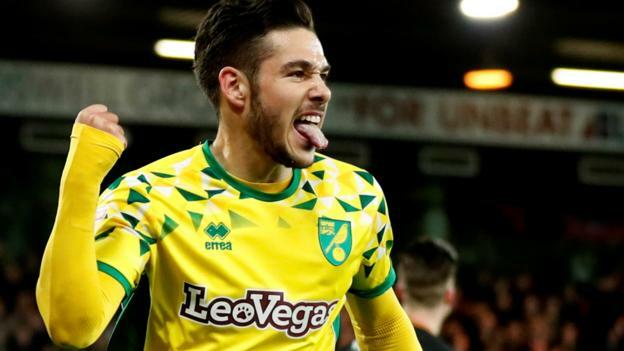 Man-of-the-match Buendia finished through Marshall’s legs to make it 3-1 after an exquisite one-two with Teemu Pukki and Norwich held on despite former striker Chris Martin’s late header for Hull. Norwich are two points ahead of second-placed Leeds and four clear of Sheffield United in third, with Nigel Adkins’ Hull staying 13th. Carrow Road was rocking after the club announced head coach Daniel Farke had signed a new deal until 2022 just minutes before kick-off, but the visitors had the better start until Stiepermann’s mazy run and finish. Buendia’s first goal was slightly fortunate, coming after ex-Canaries keeper Marshall saved from Onel Hernandez, with the ball ricocheting straight to the Argentine just yards out. Marshall’s opposite number Krul gave the ball away under pressure and was punished ruthlessly by Hull’s Pugh from outside the box but the visitors have now lost five away Championship games in a row, conceding 16 goals in that time. Norwich’s third was started by an audacious flick from Buendia, with Pukki backheeling into the playmaker’s path to finish, with Farke’s side now only nine games away from a potential return to the Premier League.